Horse riding Chile, horses and arrieros in the Andes, near Santiago. 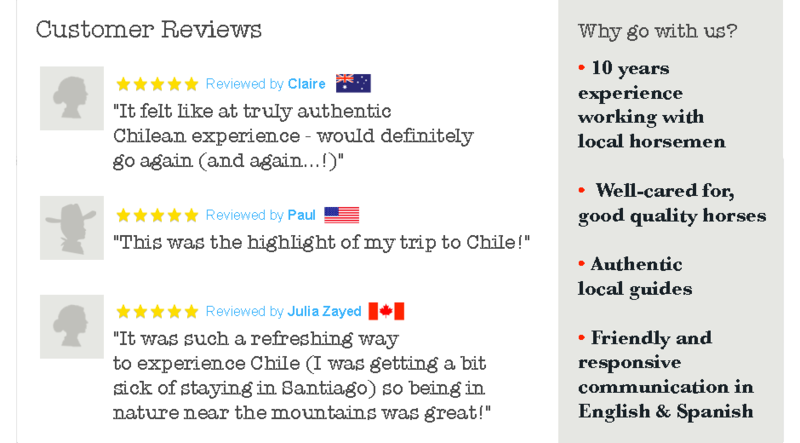 Chile is an interesting culture and great place to discover and visit. Much of it is best seen on horseback. We can take you for riding trips, long or short, with more or less adventure tailored to your preferences. Break out of the city of Santiago and join us in the mountains nearby. Horse riding in Chile is suitable for beginners up to experienced riders and it is the best way to get in touch with the countryside, the mountains and the people of Chile. Our groups are small, and for experienced riders who want to ride hard and far we take special rides which we call One-on-One. 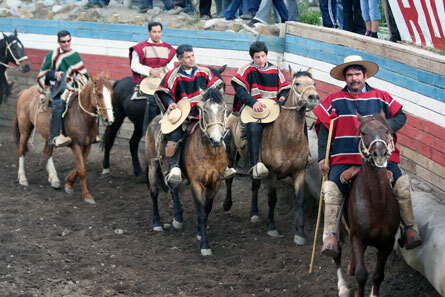 In Chile rodeos are often local events, attended by the families of the riders. After the rodeo (see also how to win a rodeo and rodeo in the countryside) the winners dance the cueca with the girls who have won the Beauty Queen event, while often the younger children ride around the media luna on their father’s horses. Our horses will be from the line of corralero horses bred to run in rodeos. Chile and arrieros go hand in hand when talking about to Chilean culture. Horse riding in Chile is still reasonably cheap, as opposed with the majority of Europe and United States prices.